The Greenville Drive (5-8) fell to the Charleston Riverdogs (7-7), 7-1, on Wednesday afternoon at Joseph P. Riley Jr. Ballpark to end its seven-game road trip. With the win, the Riverdogs took the opening series of the Battle of the Palmetto State Rivalry Series, presented by Spinx. A two-run double by Grant Williams in the top of the ninth propelled the Greenville Drive (5-7) to a come-from-behind 4-3 victory over the Charleston Riverdogs (6-7) on Tuesday night at Joseph P. Riley Jr. Ballpark in the second game of the Battle of the Palmetto State Rivalry Series, presented by Spinx. The Greenville Drive (4-7) dropped the series opener to the Charleston Riverdogs (6-6), 6-2, on Monday night at Joseph P. Riley Jr. Ballpark. Big innings were key in the four-game series between the Greenville Drive and the Rome Braves and Sunday's series finale proved no different. The Drive (4-6) put together a four-run fourth inning but it was a six-run fifth by the Braves (4-6) that was ultimately consequential, as Rome held on for an 8-7 victory to take the series at State Mutual Stadium. The Greenville Drive (4-5) used a five-run fourth inning en route to a 6-5 victory over the Rome Braves (3-6) on Saturday at State Mutual Stadium, ending a three-game skid. The Rome Braves (3-5) used a five-run fourth inning to score the only runs of the game for a 5-0 victory over the Greenville Drive (3-5) on Friday night at State Mutual Stadium. 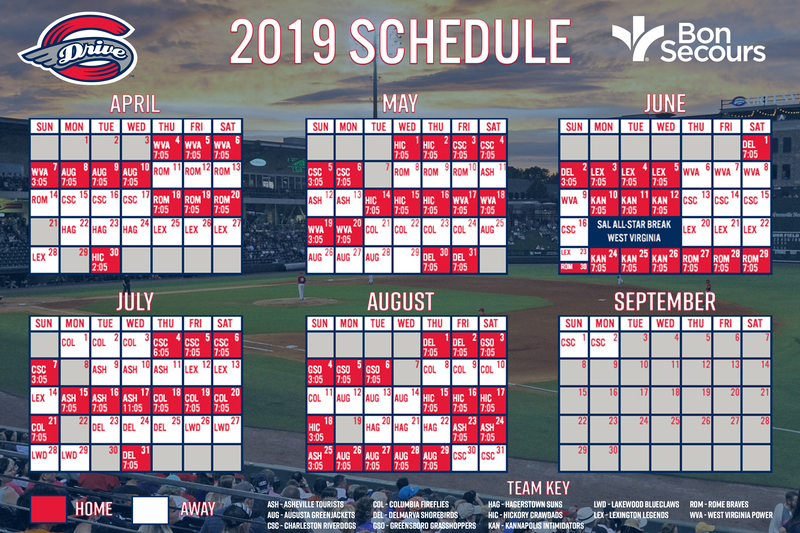 Extra innings have been the trend for the Greenville Drive early in the 2019 season, as Thursday's contest against the Rome Braves marked the third such game thus far. Unfortunately for the Drive, a lead in the top of the 10th was erased in a 4-3 loss to the Braves. The Drive and The Blood Connection are teaming up on Friday for their first blood drive of the 2019 season at Fluor Field! Stop by between 11:00 AM and 8:00 PM to donate blood, and you'll receive great rewards while saving lives! The Greenville Drive and Augusta GreenJackets engaged in a back-and-forth slugfest on Wednesday night that featured a combined 26 hits, and the visiting GreenJackets used a late run to come away with a 9-8 victory at Fluor Field.